Earlier this week, Breitbart Sports received a couple of boxes of RIP ammo for review. We took it to the range and can sum up its performance in one word – devastating. The bullet was designed in a way that fragmentation followed the cutting action. The purpose of fragmentation is not only to create separate wounds throughout a body in self-defense applications, but also to send a shock wave through the attacker’s body at the point of entry. Breitbart Sports shot RIP Ammo through an H&K USP Compact 9mm on February 7, and the shockwave created by the transfer of kinetic energy at the point of fragmentation was simply unreal. It would certainly prove devastating to an attacker seeking to catch either a male or female victim unaware. Breitbart Sports took watermelons that were eight to ten inches in diameter, placed them on top of a cooler, and shot the melons from nine feet away. With regular hollow points, a melon broke apart forcefully and scattered over a ten to fifteen foot area. With one shot from the RIP Ammo a melon literally disintegrated, blowing pieces as far away as forty feet from the point of impact. The piece that was blown furthest away landed behind the shooter. The force of this bullet is explosive to say the least. We shot hard onions that were seven inches in diameter from nine feet away as well. One round of RIP Ammo left pieces of onion scattered as far away as thirty-six feet from the point of impact. It is difficult to imagine a scenario in which firing this bullet will not save women’s lives when they come under attack by predators seeking easy prey. 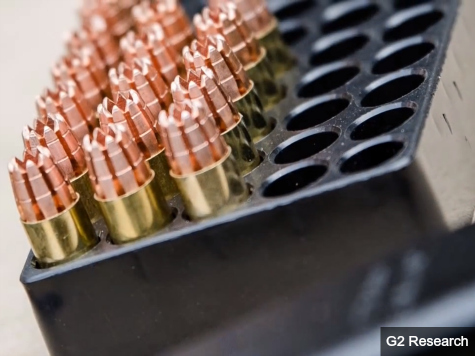 The only technical difference between the ammo Breitbart Sports shot and the ammo now shipping is that G2 Research is now using CCI #500 small pistol primers in each round.